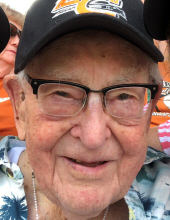 Ralph Walter Peuse, 100, passed away peacefully at his home at Heritage Assisted Living Thursday Evening, March 14, 2019. Ralph was born on July 29, 1918 in Fall Creek, WI where he lived most of his life. He grew up helping out on the family farm with his 4 siblings. In 1946, the Spalding family sold him the farm he had helped work for several years prior. On June 6, 1953, Ralph married Doris Mae Furman, the love of his life. They lived on the farm for the vast majority of their 63 years of marriage with brief stints in Kenosha and Madison. During their early years together, they enjoyed bowling, barn dances, and dancing at Fourniers Ballroom. After the birth of their sons Keevin and Keith, they also enjoyed their boy’s activities and taking family trips to various parts of the country. Ralph will be remembered as a gentle and quiet man. After retirement, he and Doris delivered Meals on Wheels for over 20 years. He was an avid Milwaukee (Braves) Brewers fan and he enjoyed singing with the Male Chorus, listening to music, league bowling and attending national bowling tournaments. He is survived by his sons, Keevin (Maria), Keith (Suzanne), granddaughter, Allie, his sisters Cecelia Strasburg and Gloria Blaede as well as several other nieces, nephews and relatives. He was preceded in death by his wife Doris, father and mother, Walter and Katherine (Horlacher) Peuse, his sister Ruth Fischer and his brother Harvey Peuse. A funeral service will be held at 11:00 a.m. on Saturday, March 23, 2019 at Stokes, Prock and Mundt Funeral Chapel, 535 S. Hillcrest Pkwy, Altoona. A visitation will be held from 4 – 7 p.m. on Friday, March 22, 2019 at the funeral home and one hour prior to service on Saturday. Burial will take place at a later date at Trinity Cemetery in Fall Creek, WI. "Email Address" would like to share the life celebration of Ralph Walter Peuse. Click on the "link" to go to share a favorite memory or leave a condolence message for the family.